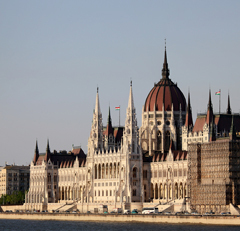 The Hungary pension system is a one-pillar statutory scheme which is a mandatory, uniform, defined benefit pay-as-you-go system with an earnings related public pension combined with a minimum pension. Hungary and Poland have abolished or significantly scaled down their mandatory private pension systems after the hit retirement savings took following the global financial crisis and confidence in the financial sector fell. The public pension system is a pay-as-you-go-financed, defined benefit (DB) scheme, covering all employees, including the self-employed. Mandatory schemes were introduced in 1998. The retirement age: the retirement age changes were announced in 2008 therefore for those who were born in 1951 or earlier the retirement age is 62 years, and since 2010 for those who were born in 1952 or later the retirement age increasing staggered to 65 by 2022 for both sexes. In order to qualify for a minimum pension from the first pillar, beneficiaries must have a contribution history of at least 20 years; a partial pension without a minimum is paid after 15 contribution years. The earnings-related public pension system is a mandatory defined benefit system where theearnings-related pension is calculated as 33% of average earnings for the first ten years of coverage.Each additional year of coverage adds 2% from year 11 to 25, 1% from year 26 to 36, 1.5% from year 37 to year 40 and 2% thereafter. The earnings base is net salary (i.e. gross wage less employee's contribution and taxes). Earlier years' earnings are valorised with economy-wide average earnings to the year preceding retirement. From 2012 pension benefits are adjusted to changes in consumer prices index.There is a minimum pension, which is worth HUF 28 500 per month. The government decidesupon the increases. The amount has remained unchanged since 2009. The mandatory second tier was a defined contribution (DC) system with individual retirement accounts. From 1 November 2010 to 31 December 2011 all payments to the mandatory fundeddefined-contribution scheme were suspended, and all contributions were redirected to thepublic pension scheme. Members of the defined-contribution scheme had to decide by31 January 2011 whether to remain in the scheme or transfer back to pay-as-you-go publicpension system. Before the reversal approximately 3.1 million people (more than 70% of the labour force)were members of the mixed system (end of 2010). After the reversal only 102 000 schememembers have decided to remain in the defined-contribution scheme. From 31 December 2011all of the social security contributions (employee's and employer's contribution) go to thePension Insurance Fund.